Different rooms have different audio needs, and a “one size fits all” music system isn’t going to get you the same level of quality sound that you can enjoy when you take a more tailored approach. At DB Media Solutions, we have more than a decade of experience designing and implementing high-fidelity multi-room music systems. Based on that unique insight, here’s an overview of the best setups for speakers in each room of your Colleyville, Texas area home. The speaker layout and type in a dedicated listening room should be different from your typical media room setup. Believe it or not, the type of music you most enjoy listening to will affect how you set up the space. In fact, the right room size for listening to classical music might not be the perfect fit for enjoying jazz. The speakers are typically placed on one end of the room, all directed toward a chair or sofa where you would sit to enjoy the music. Acoustic treatments on the side walls ensure that the best sound possible is directed toward your ears. The kitchens, hallways, bathrooms, etc. are not places you would normally think to put a high-end audio system, but the beauty of multi-room music is that you are not limited to listening to music in one particular room. To achieve this unified sound across the entire home, you’ll want speakers strategically placed in high-traffic areas. The challenge is that many of these spaces (hallways in particular) don’t offer easy placement of speakers without cluttering up the clean design. But don’t worry: hidden speakers are a great solution. The speakers are designed to blend into the walls and ceilings seamlessly. You won’t notice them as you walk into a room, but what you will notice is the high-quality sound. 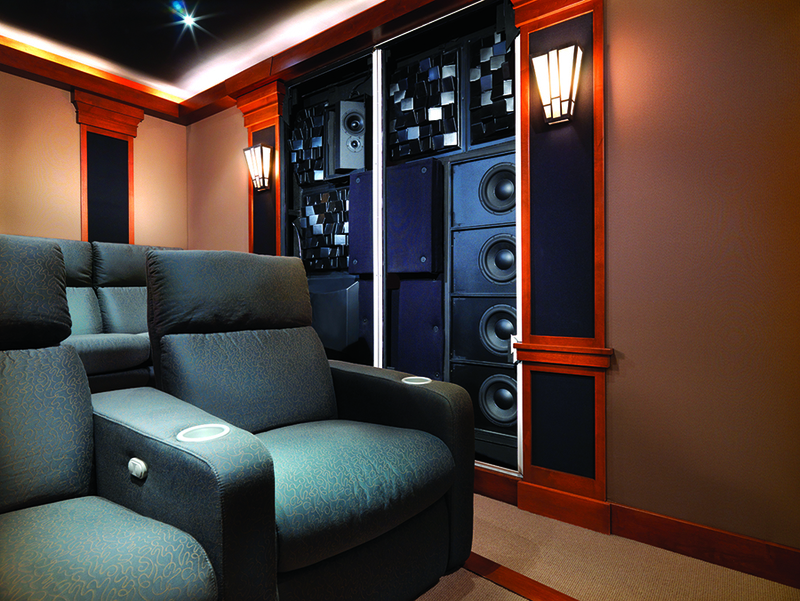 With any media room or home theater environment, surround sound is the name of the game. The goal is to recreate that immersive cinema experience that you would get at a commercial theater. There are several ways to achieve a surround sound setup. Depending on the size, shape, and layout of the room, you might opt for in-wall and in-ceiling speakers. In some cases, a soundbar below the television might be better than standard speakers. The most important thing is that the setup uses multi-channel audio equipment for true surround sound. You can always place additional speakers around the room that will complement the soundbar. To create a cohesive flow between your indoor and outdoor entertainment, it’s important to connect all of your audio equipment to one central control system. As far as layout is concerned, you’ll want to decide which areas of your outdoor space you will want to include in the audio zone—after all, there’s no point in blasting music where nobody will hear it. Once you’ve mapped out the area, your audio installer can help identify the right locations for weather-resistant speakers to avoid dead spots. Typically, you want a surround sound environment where the speakers are focused inward, not outward, so you can pump up the sound on your music as loud as you want without bothering any nearby neighbors. Every home is different, so before you start trying to piece together a multi-room music system, give DB Media Solutions a call. We’ll work with you to design an audio system that is perfectly tailored for all your home’s spaces.